Bill Gates or Mark Zuckerberg are famous and wealthy thanks to an ability they didn’t learn at school: programming a computer. Should it be part of the syllabus in our shools? Children are being raised in captivity because of growing “paranoia” about health and safety, a former Government adviser has warned. 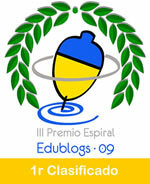 English Language Lab Asturias (ELLA) is a project created with the intention of promoting the use of ICT in English teaching. I’m proud to say I’ve been part of the ELLA team from its beginning. Now we present a new set of units, of all levels. We will publish one every ten days, alternating levels. There are two new units already published: ‘How to Tie a Tie’ (basic level) and ‘You Are What you Eat’ (Intermediate). 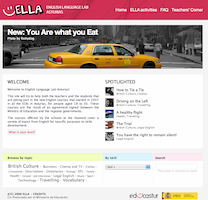 If you are a teacher, you can subscribe to ELLA and you will have access to the zip version of the units (to be used offline), pdf documents of the different sections, and direct links to audio and video files. Have a look and let us know what you think of it! Why don’t men hear a request to put out the rubbish while they’re reading a newspaper? Why do men turn off the radio when they’re parking? Why do women turn maps upside down to read them, but men hardly ever do? In their controversial book on the differences between the way men and women think, Why Men don’t Listen and Women Can’t Read Maps, Barbara and Allan Pease travelled around the world, investigating evolutionary biology, analysing psychologists, studying social change. One of the tests included in this book is the Brain-Wiring Test, designed to indicate the masculinity or feminity of your brain patterns. And here your can check the the result. This volume contains all 4 full-length novels and all 56 short stories featuring Sherlock Holmes. Sherlock Holmes is considered one of the most iconic characters in literature ever written, and this compilation allows the reader to enjoy all his adventures in a single volume. Holmes and his trustworthy sidekick Watson first appeared in the novel ‘Study in Scarlet’ (1888). After that the character would only appear in other three novels : ‘Sign of the Four’, ‘Hound of the Baskervilles’ and ‘Valley of Terror’. The main vehicle of Conan Doyle’s character were his short stories, originally written for Strand Magazine and later compiled in several volumes. Sherlock Holmes stories have a fairly simple structure: a troubled client needs help and seeks Holmes for advice, who investigates the case and solves it, using his wits and logical mind, while Watson and the police look astonished. However the tales are not great for their plots alone but for their characters and the setting. Holmes and Watson would not be the same without the Victorian setting; London, the fog and Queen Victoria’s empire are always present in the background. This volume is recommended for everyone: fans of detective novels will enjoy Holmes solving crimes using deductions and logical analysis, history buffs will get to see a first hand look into Victorian London through the eyes of this great duo and the rest will be able to discover one of the greatest characters in literature and follow his adventures from the beginning of his career to his retirement. One final warning, most of the novels and short stories were written between the end of the ninetenth century and the beginning of the twentieth, so the language used by the author can be a bit outdated and hard to follow for modern audiences but this volume is well worth the effort. Naomi Klein, Canadian journalist and writer, first published No Logo in December 1999 as a critical response to the increasingly powerful international corporations in the new globalized world. The social context in which No Logo appeared was preceded by the serious incidents during the World Trade Organization Conference in Seattle, with violent clashes between some anti-globalization protesters and the police. You can learn more about the violent incidents in this article and with the trailer of the film, Battle in Seattle that is about to be released set at the time of the W.T.O. Conference. In this interactive activity, you can watch Naomi Klein presenting her book and explaining the basic theories defended in her work. Do the exercise and see how you get on! Read some excerpts from the book: Part I and Part II. Steve Earle (1955) is an American singer-songwriter, well known for his rock and country music, as well as for his many political views. In his song City of Immigrants, from his latest album Washington Square Serenade, he talks about a reality in this globalized 21st century: you can find bits of many different worlds right next door. You can do this exercise with the lyrics of the song. Be ready to concentrate because his accent makes the task quite challenging! In the exercise there is a link to the audio version of the song, which is longer than the video above. Here’s the pdf version of the lyrics of the song with gaps and without gaps. Which is the city Steve Earle sings about? Do you think it is similar to the place you live in? Or any big cities in Spain? Tell us your opinion writing a comment for this post!